During most Provincetown winters the season begins to feel a little long and oppressive around the first part of March. Around this time of year we're usually being teased with the sounds of cardinals and other birds in the trees, and the sight of crocuses sprouting up, sometimes right through the snow on the ground, along with a rather warm day or two scattered among the snow storms. This year it's been howling winds up to 40 and 50 miles an hour that have sometimes kept us cooped up indoors as the wind chill factor makes it feel like 20 degrees out there. As usual, we've gone from the non-stop frenzy of streets crowded with summer visitors and thousands walking in the road every day to the wintertime dearth of people on the streets. In the summer there's an endless variety of entertainment to engage us and dozens upon dozens of restaurants to tempt us, and money in our pockets to enjoy both. At this time of the year many of us who work seasonally are getting eager to get back to making a living, having spent the winter pinching our pennies in order to survive the off-season with little, or no, money coming in. It's easy to begin to feel a bit isolated in these long PTown winters. 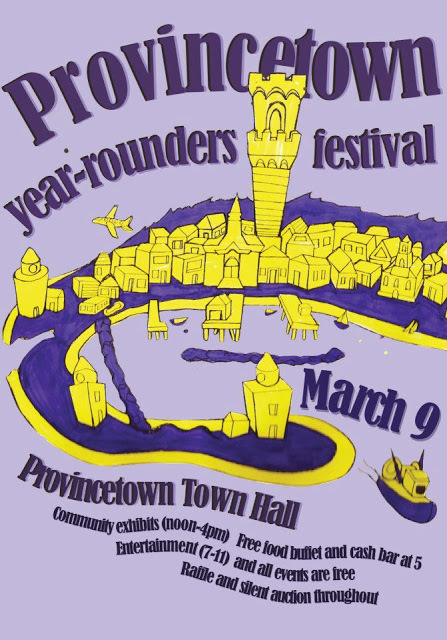 The Year-Rounders Festival comes just in time, bringing a day-long celebration of Provincetown and its people, and this year it is bigger and better than ever, with more events and activities than in past years, as well as the usual wonderful presentations by local service organizations, terrific food, and entertainment of all sorts. It all begins at noon on Saturday, March 9th, at Provincetown Town Hall. From noon till 4 PM the Town Hall auditorium will be filled with tables set up by local community organizations who provide a variety of services and information for the public. Helping Our Women, for example, serves women from Provincetown to Eastham who are living with chronic, disabling or life-threatening illness. HOW provides medical referrals, support groups, transportation to medical appointments both on the Cape and in Boston, as well as many other service and support systems, and they will have staff on hand at the festival to tell you about their organization. PTV will have volunteers present to get you involved with community television in Provincetown, and the Visiting Nurse Association will be happy to tell you how they can help with information on medical screenings, home healthcare issues and a variety of services and information they offer. Many other community groups will be in attendance, and new this year will be the crafts fair which will share the hall all afternoon, bringing you a variety of crafts made by local people, such as glass mermaids and other decorative objects, knit sweaters for dogs,, unique post cards, handmade aromatic sachets and many other types of arts and crafts. Any type of pet may be entered. Dogs wishing to compete are required to wear a collar with a current license and have vaccine info on hand. Pre-registration is not required, so there's still time for you and your snake to work up a bear costume and win a prize. All entrants receive a free raffle ticket (more about that in a minute) and winners in each category receive 5 free tickets. All day long, and into the evening, there will be a silent auction of items ranging in value from $10 to $1,000, and a raffle as well, with items donated by local residents, artists, shopkeepers, guesthouses, restaurants, Cape Air and others. Ongoing raffle drawings will begin at 6 PM, with the auction closing at 8 PM, and you need not be present to win your bid or raffle prize. Any winners not present will be notified of their prize or successful bid. Free soft drinks and a cash bar will be available, with beer for $2, courtesy of Cape Cod Beer, and Truro Vineyards will be on hand with wine for $3 a glass. After dinner there will be entertainment on the stage, with Master of Ceremonies Rollie Skreezlet. Beginning around 6:30 PM we'll be treated to acoustic and slide guitar music by Penn Dixon Colbert. Around 7 PM rock and soul band YT will perform. 8 PM will find some of our favorite drag performers taking the stage, such as Jonathan Williams, Dana Danzel, Barbie Que, Thirsty Burlington and Anita Cocktail. The Daggers promise classy rock and roll beginning at 9 PM. Times are approximate, of course, but it may be a good idea to arrive ahead of time if you intend to come for a single event, or be prepared to wait a bit as bands set up, or as volunteers convert the auditorium form a crafts and information fair to a huge dining room. Don't forget, dinner and DJ are scheduled to start at 5PM and entertainment will follow dinner, till perhaps 11 PM. Come and join us for this wonderful, free community event celebrating the best of Provincetown. As always in PTown, everyone is welcome.